I spend hours wasting my time with clients who make up the "best" excuses on why they have not paid their bill. Oh, you just made up your own payment plan? Fantastic. You ignored the email I sent you back in June? Wonderful. You think I'm getting meaner from my crazy hormones? Probably, but it would make it better if you paid your bill. Collecting payments is the worst job on the planet. I hate it. Hate is a strong word, but I really hate it. Everyone has those days. Whether it be on the eve of a full moon or like me today, at the end of Ramadan. When you have one of those days, it's called craposis. It's a scientific term. There's no better way to describe it. I just got the cheques you supposedly mailed 2 months ago? craposis. The cat threw up on you this morning ? craposis. If I can't have wine, I'm going to soothe myself with carbs. 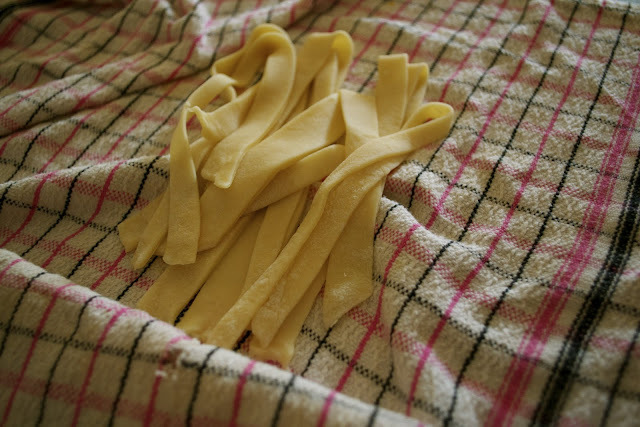 Homemade pasta, which is shockingly easy to make, even without a pasta machine. 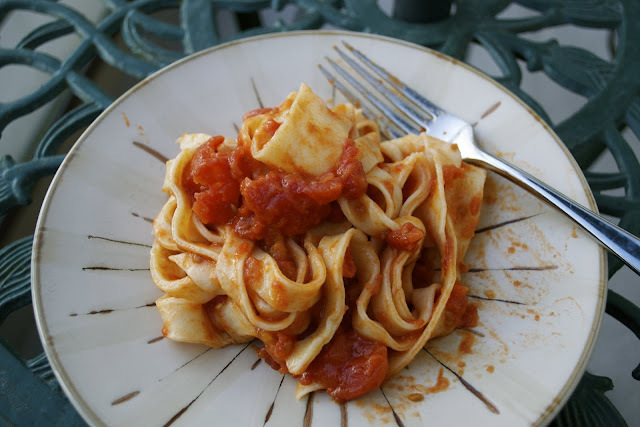 And single handedly the best, easiest, freshest, tasting tomato sauce I've ever eaten. The sauce is made with 3 ingredients. 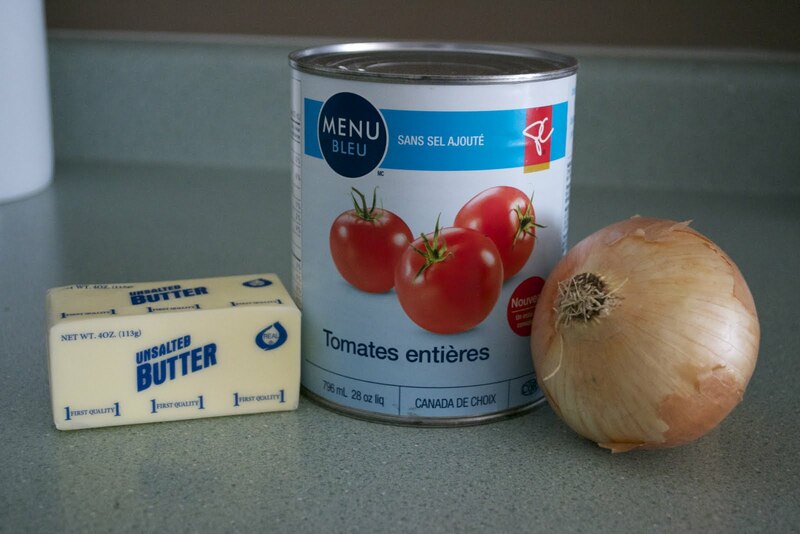 Butter, canned whole tomatoes and an onion. How can something that simple be so delicious? Easy, because it's simple. 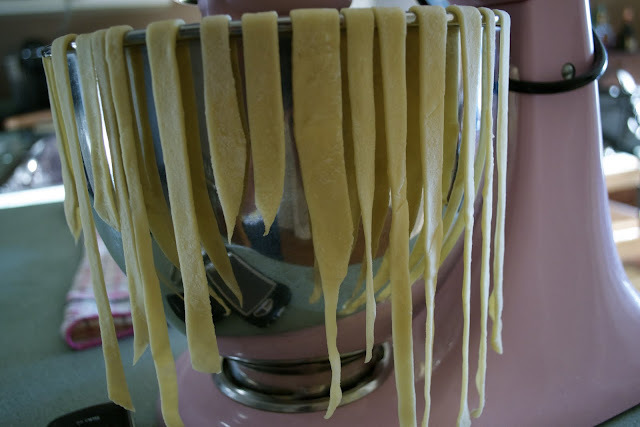 It's my new go-to pasta sauce and it can be made in less than an hour, perfect for days filled with craposis. Place all ingredient in a large saucepan over medium heat. Bring mixture to a simmer, then turn down to low, just enough so you have a low simmer. Simmer for 45 minutes, stirring occasionally, crushing the tomatoes with the back of a wooden spoon. 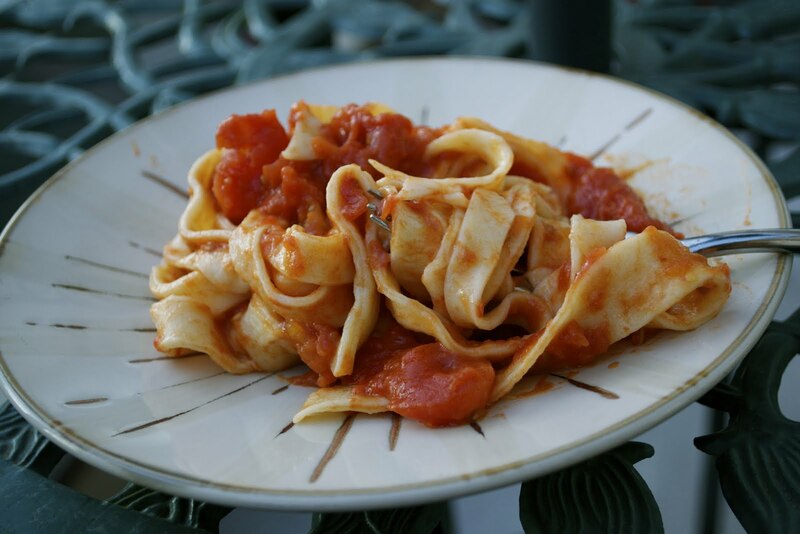 When mixture has thickened slightly and little drops of fat float freely around the tomato chunks, remove onion and keep warm until pasta is ready. You can serve this with Parmesan cheese sprinkled on top, but I found it just perfect without. Combine all ingredients in the bowl of a food processor, pulse until mixture starts to form a ball. Add water, drop by drop if needed. Dough should be firm but not sticky. Run dough through processor for 15 more seconds to knead. Invert dough on to a floured surface and cover with a bowl for about an hour to let the gluten simmer before rolling. Roll and shape into desired shapes.